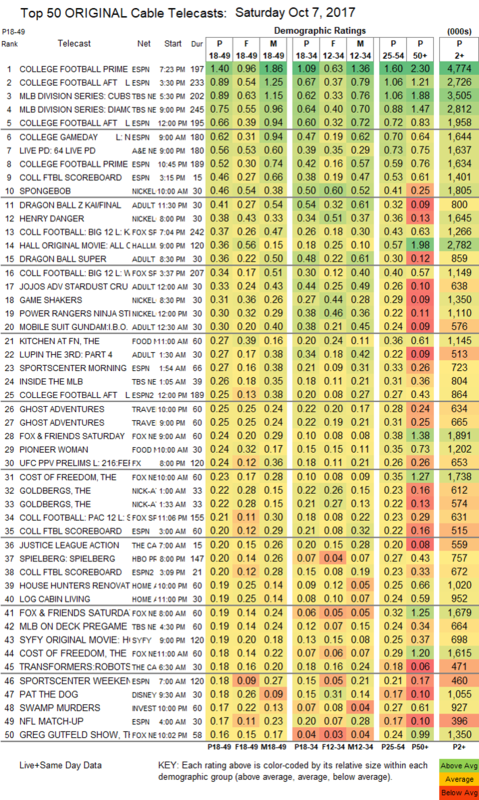 NETWORK FINALS: ABC’s COLLEGE FOOTBALL game held at 1.9, and FOX’s game adjusted up 0.1 to 0.5. In addition, the reruns of DATELINE and SUPERSTORE lost 0.1 in final numbers. CABLE HIGHLIGHTS: Saturday cable was particularly sports-heavy, with both COLLEGE FOOTBALL and the MLB PLAYOFFS crowding the top of the chart. ESPN’s games were #1-2 at 1.40/0.89, with additional games at 0.66 and 0.52. TBS’s baseball games were at 0.89/0.75. 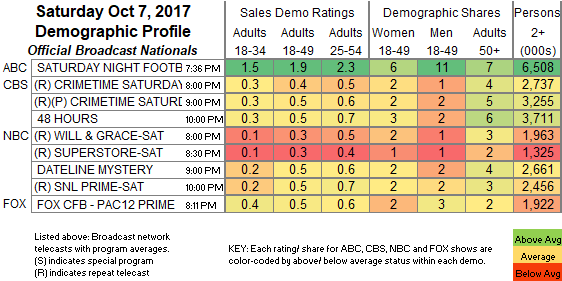 The top-rated non-sports telecast was A&E’s LIVE PD at 0.56. Nickelodeon’s 10AM SPONGEBOB was steady at 0.46, and the network’s primetime HENRY DANGER rose 0.07 to 0,38, with lead-out GAME SHAKERS up 0.04 to 0.31. Hallmark’s movie ALL OF MY HEART INN LOVE was at 0.36. Adult Swim’s line-up performed as follows: in primetime, DRAGON BALL up 0.02 to 0.36 and up 0.04 to 0.26/670K, and in late night, DRAGON BALL up 0.12 to 0.46/875K and steady at 0.41, JOJO’S BIZARRE ADVENTURES up 0.05 to 0.33, MOBILE SUIT GUNDAM at 0.30, HUNTER X HUNTER up 0.05 to 0.31/590K, LUPIN THE 3RD up 0.02 to 0.27, NARUTO up 0.03 to 0.28/509K, OUTLAW STAR up 0.01 to 0.24/440K, COWBOY BEBOP up 0.01 to 0.22/423K, and ATTACK ON TITAN up 0.02 to 0.20/383K. On Food Network, KITCHEN AT FN rose 0.04 to 0.27, PIONEER WOMAN climbed 0.02 to 0.24, and VALERIE’S HOME COOKING was down 0.02 to 0.15. FX’s UFC PRELIMS was at 0.24. HBO’s documentary SPIELBERG was at 0.20. HGTV’s HOUSE HUNTERS RENOVATION fell 0.07 to 0.19, and LAKEFRONT BARGAIN HUNT lost a tenth to 0.16. Syfy’s original movie HOUSE OF THE WITCH was at 0.19. ID’s SWAMP MURDERS fell 0.04 to 0.17. On OWN, IYANLA FIX MY LIFE ticked down to 0.14, and RELEASED was at 0.11. AMC’s penultimate HALT & CATCH FIRE dropped 0.03 to 0.08.